Jamie is a care-free, easy-going surfer who has everything. His life appears perfect, but reality is far from it. He has his share of secrets, including one that burns deeper than any other. It’s a good thing Callie hates him because if she didn’t, Jamie knows there’s no way he’d be able to stay away. 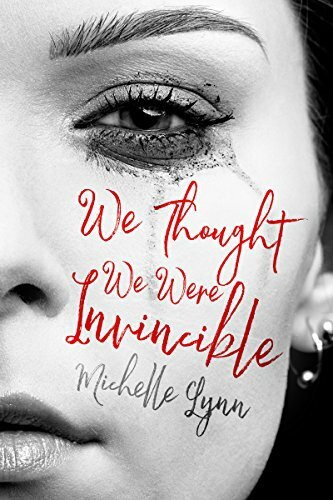 Click here to pick up your free copy of We Thought We Were Invincible in the Amazon Kindle store. There is nothing better than a good book. Other than maybe a good hero <; I’ve loved reading all my life and am excited I get to spend my time sharing stories with others. Under M. Lynn, I escape into fantasy worlds where magic and princes roam the land. Michelle MacQueen is a bit more reserved. That side of me delights in the slow burn of a good love story. Sometimes, the two people in my head war with each other trying to come out, but I make time for both. In my free time, I’m a full-time aunt to the most amazing niece and nephew. I love hockey and warm weather which seem to be at odds with each other. I’m a simple girl living in this complicated world and I’m so very pleased to connect with you. You can visit Michelle’s Amazon author page if you click here.